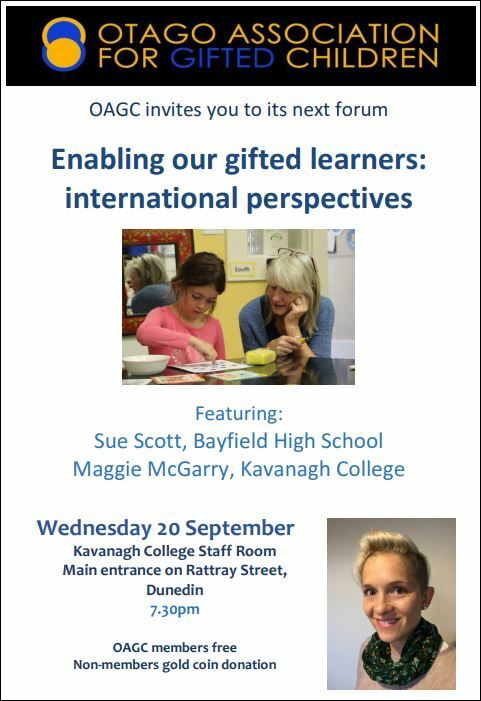 The evening will feature presentations on international events in gifted education from two local teachers, Maggie McGarry from Kavanagh College and Sue Scott from Bayfield High School. Maggie recently attended the World Council for Gifted and Talented Children’s 22nd Biennial World Conference in Sydney. She will share with us some of the highlights and resources from this conference, including ideas on leadership in gifted education and self-advocacy for gifted learners. Sue will talk about her recent visit to a school for gifted children near San Francisco and share some ideas from a conference she attended in Lisbon on Innovation, Excellence and Creativity in Education and Psychology. These events were funded by a Woolf Fisher Fellowship for educational excellence in teaching awarded to Sue in 2017.